Hans-Down The Easiest, Yummiest Parfait Ever! Stir honey and yogurt, set aside. 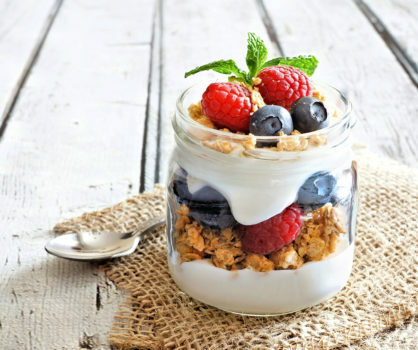 In two mason jars or glasses, take turns layering the yogurt mixture, rolled oats and fruit. Top each glass with a dusting of the cinnamon or nutmeg and a sprig of mint. Enjoy!